THANKS TO ALL speakers, volunteers and participants. 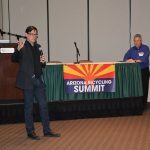 You all made Arizona Bicycling Summit 2016 a success! CLICK HERE FOR SUMMIT 2018. Vehicle Parking: UPDATE Free parking in garage just east of convention center [parking map] — please do not use the surface lot west of the convention center. Bike Parking: There should be ample room to bring bikes into the meeting room. 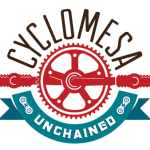 $25 for early/regular on-line registration, through March 20, 2016. Sen. Farley speaking at the summit. Here’s a summary of the 2016 Summit presented at the 4/19/2016 MAG Bike/Ped Committee meeting. Also note that all public materials from the Summit are in this shared folder. Thanks to The Damion Alexander Team (facebook login may be required to view), there’s a photo album from the summit. Here is another set of photos.